Kitchen cabinet refacing in Moon, considered a close substitute to cabinet replacing, has become a popular choice for homeowners today. It does not carry the hefty price tag, like a full kitchen remodel, nor does it involve a complete removal of old cabinets and replacement of new ones. Kitchen cabinet refacing entails the removal of existing drawer faces and doors and installation of new ones. With refacing, your existing cabinet boxes remain intact. If you have found yourself wanting to transform the appearance of your kitchen without the expense and the hassle of a kitchen remodeling project, Desirable Kitchens & Refacing in Pittsburgh has the right solution for you. Residents in Moon, PA, can expect exceptional quality and customer service by hiring Desirable Kitchens and Refacing to reface their kitchen cabinets. Typically, our experienced team of professionals can have kitchen refacing projects completed within 3-5 days. We pride ourselves on transforming your kitchen into the kitchen of your dreams– without the mess and the hassles of a full remodeling project that could leave you out of your kitchen for months. 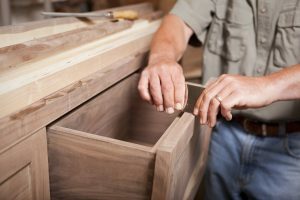 To prepare your kitchen cabinets for refacing in Moon, we first remove the existing doors and drawer fronts, including drawer boxes and glides, if needed. At this time, Desirable Kitchens and Refacing can also remove and dispose of all trim, valences, toekicks and existing countertops. If the cabinets are structurally sound and do not require replacement, then the next step is to prepare the existing surface for refacing. Desirable Kitchens & Refacing will sand the frames, sides and exposed surfaces back to a clean, original surface. This will ensure that the new veneers adhere to the existing cabinets. At this point, your bare cabinet boxes are ready for transformation. If you live in the Moon, PA, area and are looking to upgrade your kitchen to what you always dreamed it could be, contact us today. Cabinet refacing is a quick and simple process when hiring experienced professionals, such as Desirable Kitchens and Refacing. We work with you to find the most cost effective and time efficient way to get the job done. Desirable Kitchens and Refacing in Pittsburgh has the right solution for every customer—every time! call 412-515-0582 or contact us to begin your transformation today!